Q: How many people work at SDPB? A: South Dakota Public Broadcasting operates TV and Radio statewide, 24-hours-a-day, 7-days-a-week. That takes a lot of people. SDPB has about 60 employees who work at the Al Neuharth Media Center on the campus of USD in Vermillion. About 18 more (both SDPB and Friends of SDPB employees) are located at various locations across the state. Q: How can I find out about job openings at SDPB? A: As part of the Bureau of Information and Telecommunications (BIT) all job openings are listed on the South Dakota Bureau of Human Resources jobs site, online at http://bhr.sd.gov/default.aspx. All inquiries and applications should be directed to the Bureau of Human Resources. Q: Does SDPB offer internships? A: Yes. At various times throughout the year, different departments at SDPB offer internships. Our internship program gives students hands-on and comprehensive experience. Openings are listed on the Internship page of the Bureau of Human Resources website at http://bhr.sd.gov/workforus/intern.aspx. Openings for internships subsequent semesters are listed early in the term, so the earlier you apply, the better. Q: How many towers does SDPB have? A: SDPB Television has nine transmitters. We also have six TV translators, which are low power transmitters. SDPB Radio has ten transmitters and 10 translators. When possible, Television and Radio share transmitter space. Q: How much does it cost to run SDPB? A: Programming for TV and Radio costs about $1 million a year. On top of that there are salaries, equipment, infrastructure like microwave and towers. We receive funds from four primary sources: the State of South Dakota, the Corporation for Public Broadcasting, grants, and private donations. Money to pay salaries and infrastructure comes from the state budget. Money to pay for outreach activities primarily comes from grants. Money to pay for programming comes from donations by individuals to our Friends organization. If you would like to donate to SDPB, click here: http://www.sdpb.org/donate. Q: Doesn't PBS pay for everything? A: South Dakota Public Broadcasting is a local broadcaster with TV, Radio, Internet and Education & Outreach. 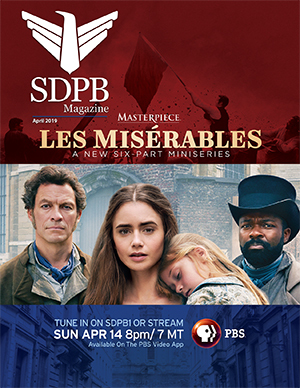 SDPB Television presents more than 270 hours of original local programming each year. We are a PBS affiliate and we pay for PBS programming, but we also get programming from other groups like the National Educational Telecommunications Association and independent filmmakers. Likewise, SDPB Radio airs locally produced programs, in addition to shows from NPR, PRI, American Public Media, and other program providers. Q: Don't you make money from toy sales? A: We wish we did. The production companies that produce shows like Sesame Street and Barney own the rights to the characters. We simply pay for the programs. Q: Why don't you have more.... ? A: SDPB serves a statewide audience, so our program offerings are as varied and diverse as our audience. Programming decisions are made based on several factors: budget, availability, the nature of the program (educational, entertainment, uniqueness, etc. ), how well it fits with our mission, and input from our audience. We strive to achieve balance in our programming. Our goal is to bring the world to South Dakota, and bring South Dakota to the world with unique programs that you can't see or hear anywhere else. The digital TV transition has allowed us to offer additional channels of programming. Similarly, HD Radio (where available) gives us the opportunity to offer alternate audio programming streams. These channels serve various niches. Q: How much does it cost to make a TV program? A: Each program is different, depending on length, resources, talent and other variables. Local program can cost anywhere from $10,000 to over $100,000. A national program like "Masterpiece" can cost millions to produce. Q: I have an idea for a TV program. How do I go about getting it on SDPB? A: SDPB TV works with a number of independent producers interested in creating programs that may be broadcast on SDPB Television. Download the .pdf documents to learn about the process and our policies. .
Q: Does SDPB have speakers who can make presentations for community groups, and if so, how much do they charge? A: Yes, SDPB has several speakers who can give presentations on a variety of topics, such as the educational resources available from SDPB, how to use children's television wisely, why broadcasting still matters, etc. There is no charge to your group for the presentations made by SDPB. Q: My organization has an event we'd like you to promote. What do I need to do? A: We have a community calendar online that allows you to upload all of the pertinent information about your event. Visitors to our website can find your event there, and from the events submitted to that site we choose those that are included on daily Arts and Activities calendars that we air on SDPB TV and SDPB Radio. To access the site, go to www.sdpb.org and click on "Calendar." Then scroll down on the Calendar page and click on the "Submit Event" button. Once you fill out the form and it's submitted it gets placed on the site. This service is free. Q: How has the digital TV transition affected SDPB? A: SDPB TV broadcasts three channels. SDPB-TVs primary channel, SDPB1, is broadcast in High Definition and the alternate channels are broadcast in standard definition. HDTV provides improved picture and sound. It is not necessary to have an HDTV to enjoy the programming on SDPB1 - a standard definition digital TV, or an analog TV with a converter box can also be used to pick up all of our TV channels. Some cable systems do not offer all of SDPB's TV channels. We suggest you call your service provider to urge them to pick up our alternate channels. SDPB is willing to work with local cable companies to ensure that all of our programming is available to all viewers who want it.